Peanut butter paired with another nut? Why not? 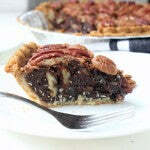 Dark chocolate peanut butter in the filling works beautifully in this pecan pie variation. My favorite Thanksgiving dessert has always been my grandma’s pecan pie, and it’s a running family joke that I’m always first in line for a slice. But having this special treat once a year just isn’t enough, so I decided to make my own version of pecan pie with a little something extra – Dark Chocolate Dreams peanut butter! 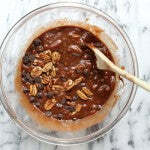 This wonderfully sinful addition creates the most velvety, insanely rich filling, and the flavor combination of pecans + peanuts only adds to the tasty appeal. And best of all? This recipe couldn’t be simpler! A premade crust, 10 ingredients, a few stirs, and barely a hour in the oven is all it takes before you’ll be diving in fork first. 2. Place frozen pie crust on a 9-inch pie pan. 3. In large mixing bowl combine the eggs, unsalted butter, sugar, peanut butter, oil, salt, and vanilla, stirring until smooth. 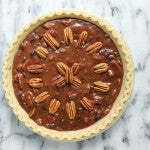 Next stir in the pecans and chocolate chips, then transfer filling to frozen pie crust. 4. 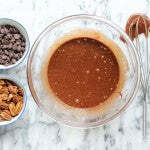 Top filling with any desired pattern of pecans, then bake on oven middle rack for 15 minutes before lowering the temperature to 350°F. Continue to bake at 350°F for another 35 minutes until the edges are set and the center still slightly jiggles. Remove from oven and cool completely (about an hour), then plate and serve. 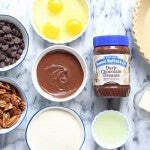 The post Chocolate Peanut Butter Pecan Pie appeared first on - Peanut Butter & Co. Recipe Blog.